IT took $10 billion, the world’s largest particle accelerator and decades of research, but now scientists are convinced: The universe in fact, really doesn’t exist. Or at least it shouldn’t. So, is it back to the drawing board or should we all vanish in a puff of logic? The nature of the newly discovered Higgs Boson particle appears to point to the universe blinking out of existence mere moments after the Big Bang. “This is an unacceptable prediction of the theory … if this had happened, we wouldn’t be around to discuss it!” one of the researchers who discovered this discrepancy stated. When the data from the world’s most expensive experiment is plugged into the physics “equation for everything”, otherwise known as the Standard Model, it comes up trumps. So it seems the Large Hadron Collider, built under the French-Swiss border, has a lot more proton-smashing to do to get to the bottom of life, the universe — and everything. So to do astronomers. The problem is with the moments after creation itself. Matter materialised out of the Big Bang, hurtling outward in all directions — rippling through space-time as we know it. Known as the theory of Inflation, it is a model that helps explain how the Universe looks and works today. Enter the Higgs Boson, or “God” particle. It’s had a similar impact on physics as the Babel fish from Douglas Adam’s famous book, The Hitchhiker’s Guide to the Galaxy, had on God. Cosmologist Robert Hogan, of King’s College London, has told a meeting of the Royal Astronomical Society that this tiny, poorly understood piece of the universe doesn’t seem to fit established thinking. Controversial research earlier this year has been presented as direct evidence of this stage of rapid universal growth: Ripples of residual gravity waves may have been spotted against the cosmic radiation background. Called the Background Imaging of Cosmic Extragalactic Polarisation (BICEP2), its findings are regarded as incomplete. 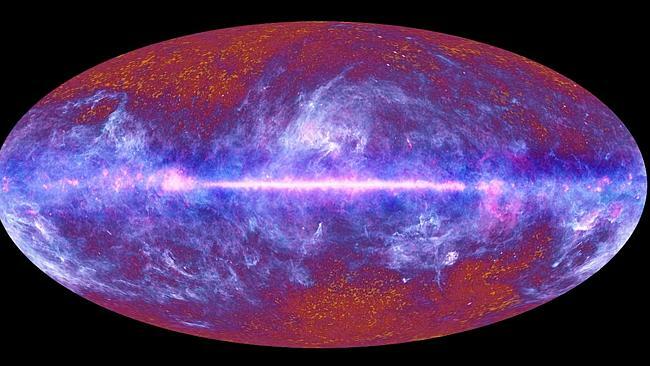 Background picture … the mottled textures at the top and bottom of this picture of the universe as seen from Earth shows the “cosmic microwave background radiation” which may contain ripples from the Big Bang. When combined with the properties Higgs Boson, a particle which is supposed to give mass to the universe, the two seem to suggest that Inflation would have headed towards a Big Crunch within a fraction of a second. As a result, we shouldn’t exist. The Large Hadron Collider will malfunction, bringing about an end to the world as we know it, in an upcoming movie possibly directed by Dark Knight writer David S. Goyer. A movie has been proposed that will take the Large Hadron Collider (LHC) – one of the greatest feats of theoretical physics and engineering in the modern age – and turn it into a doomsday device in typical Hollywood fashion. The collider is designed to push proton beams close to the speed of light, traveling in a 17-mile loop 11,000 times a second. Two beams are launched simultaneously in opposite directions only to eventually collide into one another – simulating the chaotic conditions directly after the Big Bang that formed this universe. Researchers traditionally observe the collisions to learn more about the greatest mysteries of the Universe, including the mass of electrons, dark matter, and even how black holes come to be. However, in Hollywood producer Lorenzo di Bonaventura’s proposed doomsday movie The Breach, this relatively harmless device will somehow horribly malfunction. According to Bonaventura, who also produced the first Transformers movie, the plot of The Breach will center around the story of a corrupt ex-cop trying to start anew, and a disaster with the LHC. The details of this disaster however, remain unclear. Bonaventura did reveal that the movie involves secret groups, government conspiracies, alien technology and black holes – quite a list. Goyer, the man who scripted parts of The Dark Knight trilogy, Blade and the upcoming Batman vs. Superman, is rumored to be the director of this movie, although it has not been officially confirmed.